strategy. It has to be considered that an innovation is such when it cannot be managed with the existing “mindset” and requires a change of habits. This research included, among others, the applications at Diners Club (1981), American Express, ING, ABB, BASF, Massey Ferguson, Shell, La Caja, Renault, IBM and TWG. This strategy is based on accepting the natural competition between the existing technologies and the new technologies. This competition might have two different concepts: It might be a supplementary competition that implies an opposition of the organization or it can be a complementary competition that is based on the acceptance of a new additional value. The “supplementation based competition” inhibits any innovation while the complementary competition works as a “gravitational force” to introduce innovations. This gravitational force provides a stable context for the implementation of innovations and sustains the need for them. “Supplementation based competition” is such when there are “ego conflicts” between the new technology and the leaders of the organization. This is frequent in small organizations, which are naturally reluctant to innovations. This type of competition is based on considering the new technology as redundant with the existing technology. Complementary competition, on the other hand, requires using an outsourcing process of innovations. This implies the outsourcing of the coordination of the process, including the client in such process. 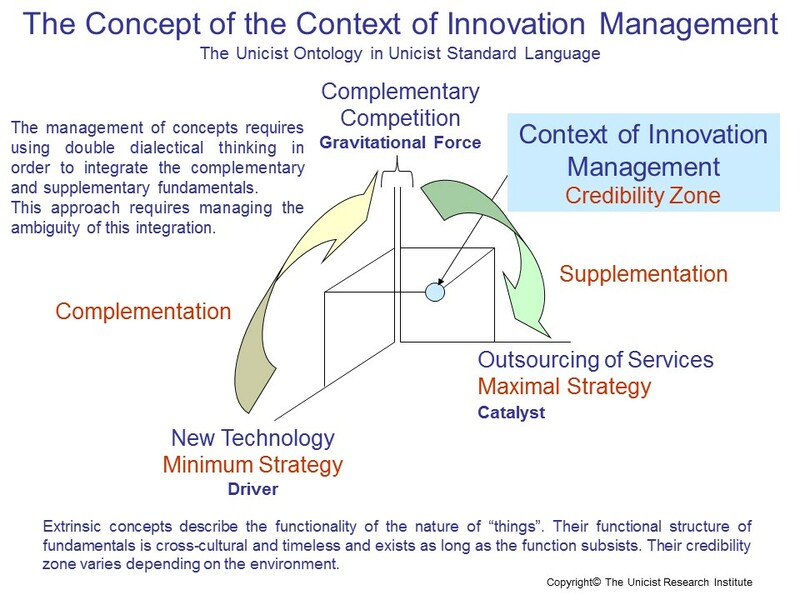 This allows introducing the concept of the innovation in order to introduce the necessary “mindset” in the organization.  It does not include the outsourcing of the operation, which is done by the members of the organization. This outsourcing process works as a catalyst to introduce the innovation, which takes advantage of the natural complementary competition and transforms it into the main force to induce the changes. Using the outsourcing of services as a catalyst is the most effective way to introduce innovations. But this role has to be formalized in a contract that needs to have an expiration date to ensure that the outsourcing service is not a business in itself. When the outsourcing process is not formalized, the complementary competition evolves towards a “Competition based on Supplementation” and the change is neutralized. These outsourcing services need to be managed by Think Tanks integrated by members of the Unicist Group and members of the client. The conclusion of this research work is the end of the research cycle 2015-2016. 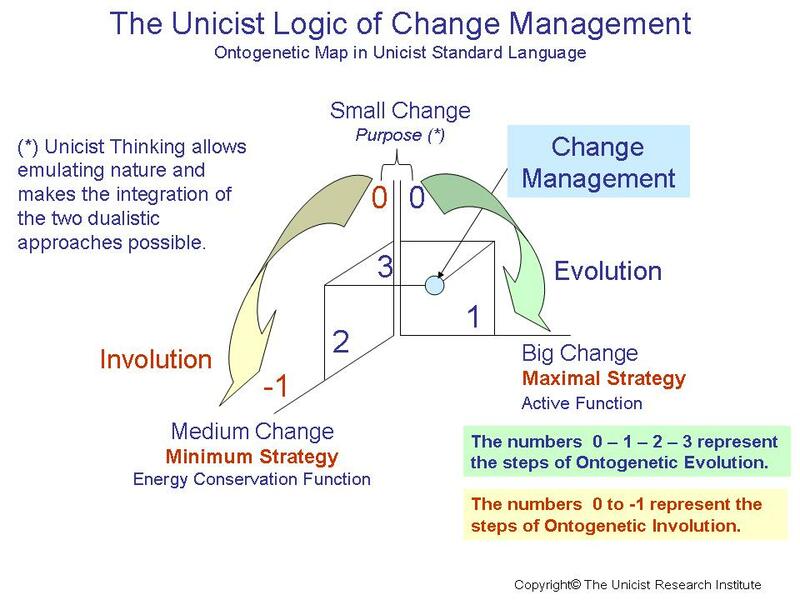 This is the “change management” strategy that has been formally adopted as a standard by the Unicist Group and its members. 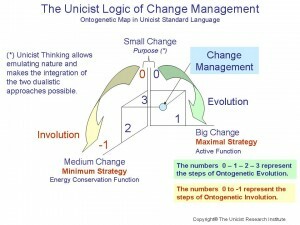 It is the application of the paradigm shift in sciences in the field of “change management”. It makes change management be manageable. They are the changes that drive towards a higher level of structured action, responsibility or risk. Big changes require drivers and catalysts to be implemented. Big changes can be divided into structured medium changes. They are those changes that seek for a more structured activity with lower risks. Medium changes cannot be divided into small changes. They are changes that require no structural modifications. Change agents are usually left behind after a change was successful.  Avant Garde Groups were created to design and implement organizational changes. 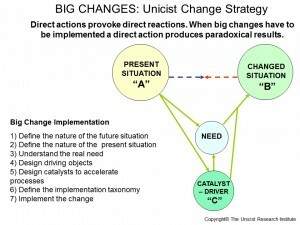 Thus the role of a Change Agent becomes virtual and is not affected after the changes are implemented. 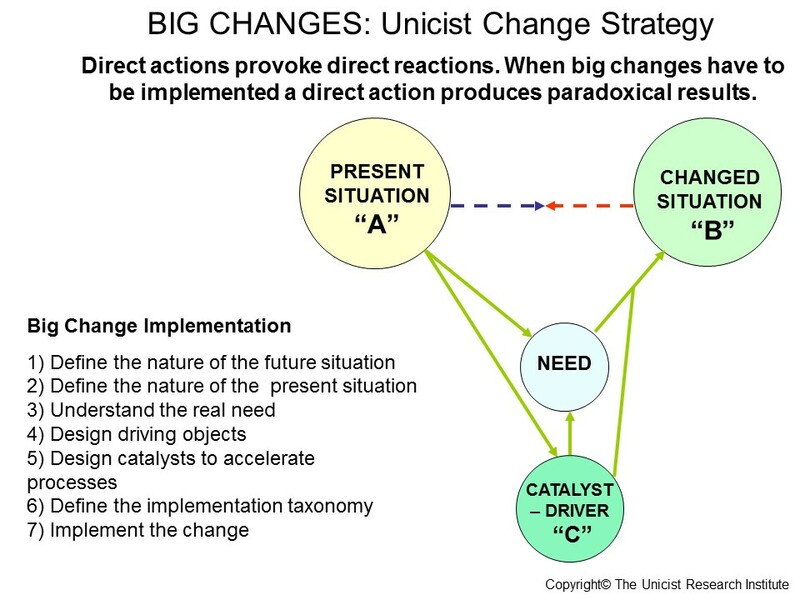 Change managers manage the change while “A” Groups do the changes. 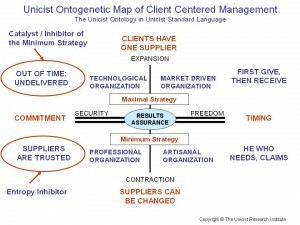 Client Centered Management is a model that catalyzes market expansion processes. 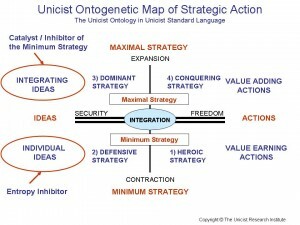 It is part of the unicist natural organization model. 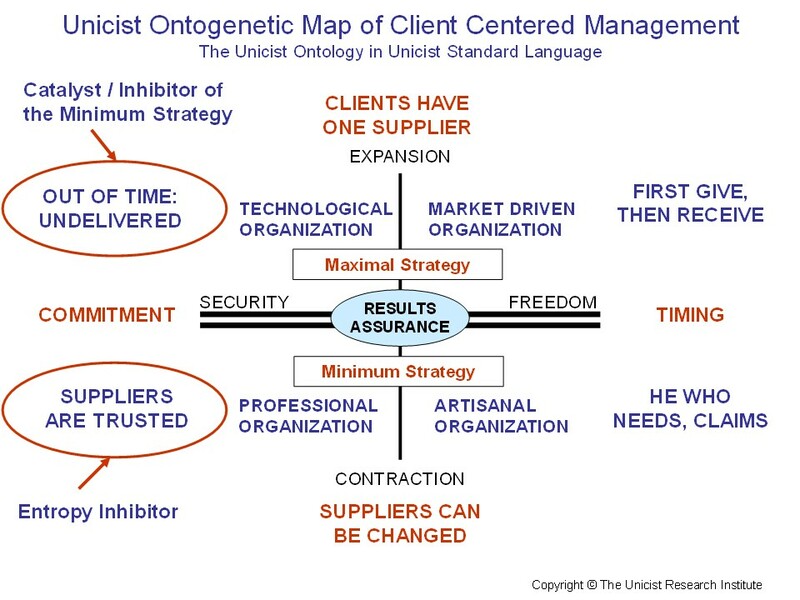 The natural organization is a meta-model in itself that integrates the organization that is needed for the business and the market, the client orientation and the personalization of the work processes. Client Centered Management needs to be established to drive actions towards the end client and then the personal organization needs to be used in order to ensure the fulfillment of the organizational roles. The functionality of the Client Centered Management model is driven and catalyzed by the use of business objects that save energy and make processes simpler and more effective. Thus CCM is the natural model for business expansion. It has to be considered that it requires business objects driven processes and a role model that allows managing responsibilities. Nature, as a paradigmatic complex adaptive system, is organized by objects. The unicist organizational approach is based on emulating nature to manage businesses as adaptive systems. 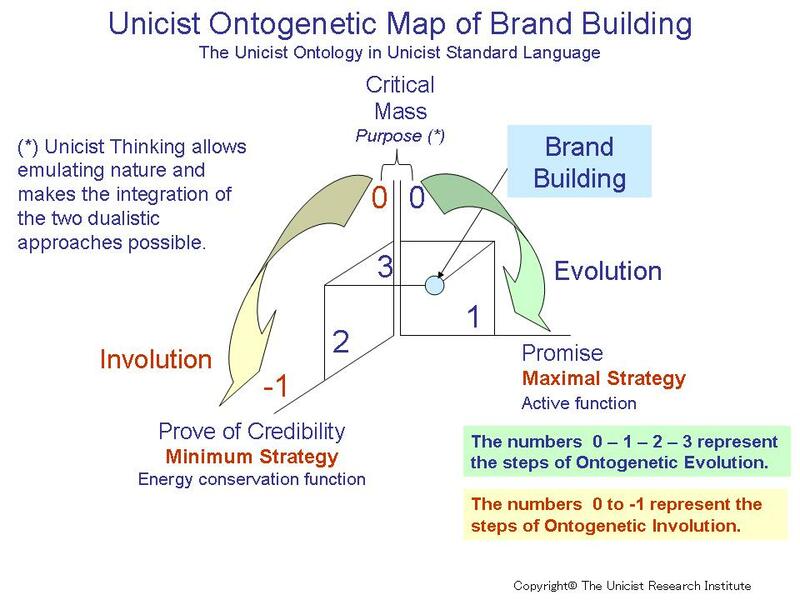 The unicist object driven organization is the natural way to organize based on the knowledge of the ontogenetic maps of a business and its functions. It implies integrating business objects in the business processes that allow managing the adaptive aspects of businesses accelerating processes while saving energy. Object driven marketing, object driven strategy, object driven management, object driven continuous improvement, object driven negotiation and object driven leadership are paradigmatic examples of the object driven organization. This worked well when the influence of the actions allowed dominating the environment and failed when this was not the case. CCM is a management model that was developed to establish the rules for an optimum use of the company’s energy so as to satisfy its internal and external clients and catalyze business expansion. When talking about the external client in the company we necessarily refer to the customer and the shareholder. CCM is a meta-model to provide result-assurance, client orientation and secure added value to an organization. It is the natural model to expand businesses. Conceptualization sustains any proactive action in the field of adaptive behavior. That is why it applies to individual, institutional and social behavior. Conceptual thinking is an abstract thinking process that is based on discovering the concept at an operational level, emulating their structure in mind, and transforming this emulation into value adding actions. In plain language, conceptualization implies knowing what one is truly doing, having the concepts of the actions, which includes having their functional structure and being able to transform the concepts into value adding actions. The paradigm shift is given by the conceptual approach to businesses and its integration with the existing technical analytical approach. It allows integrating the knowledge of the empirical observable facts with the knowledge of the “nature of businesses” in order to define what is possible to be achieved and the probability to make it happen. The research on how the logical thinking process works, allowed defining four levels: operational thinking that deals with the “HOW”, analytic thinking that deals with the “WHAT”, systemic thinking, that deals with the “WHAT FOR” and conceptual thinking that deals with the “WHY”. 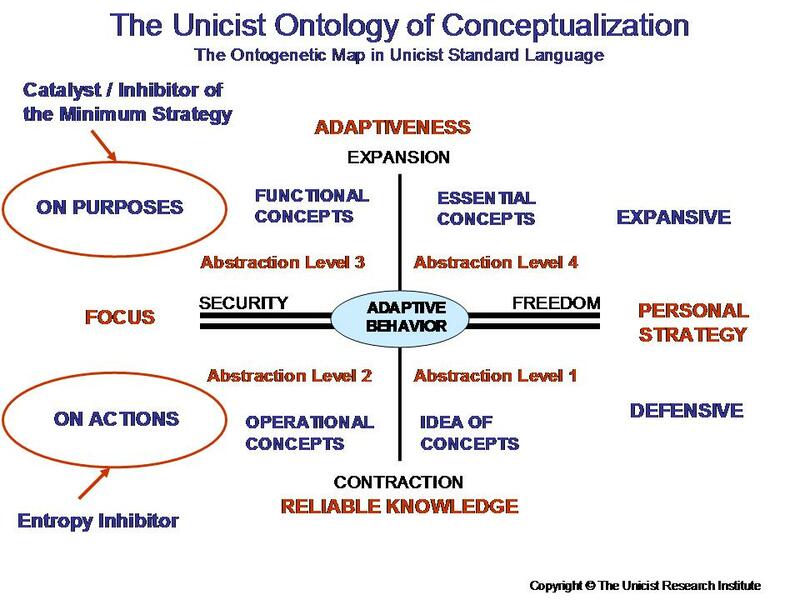 Conceptualizing implies being able to have an adaptive behavior sustained by the capacity of apprehending the nature of what one is doing while one is able to apprehend the operational aspects of the actions. 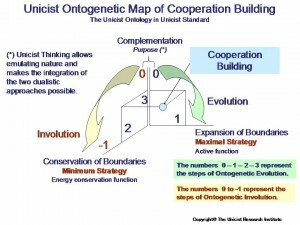 The discovery of the ontogenetic intelligence of nature allowed finding the roots of evolution, involution and mutation. This intelligence drives the purpose of the living beings in nature based on an active principle that sustains growth, change and mutation, and an energy conservation principle that saves energy while it sustains the purpose. This principle compensates the entropy produced by the active function. The objective of any thinking process is to be able to emulate the models that underlie the tangible aspects of the world that can be accessed through sensory experiences. The objective of conceptual thinking is to emulate the nature that underlies specific aspects of reality in order to influence the environment. Functional concepts are cross-cultural and timeless. They remain unchanged as long as a function exists. Having the concepts of what one is doing allows being extremely effective and flexible. An individual can adopt new operational technologies without needing to change because the concept remains the same. Conceptualization enhances the human condition. The term Concept in Western philosophy can be found in the works of Plato and Aristotle. Their approach drove to the definition of concepts as describing the essence of things defined as a universal realm. Ernst Cassirer (Substanzbegriff und Funktionsbegriff) included the definition that concepts not only define the essence of things but also their shape. Descartes can be considered as the initiator of a new stage by defining the word “idea” as homologous to concept. But empiricism, with Locke and Hume gave to the terms “idea” and “concept” only a psychological meaning. 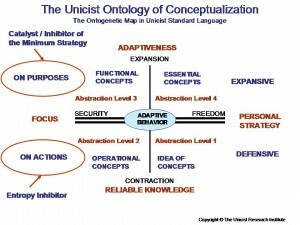 Immanuel Kant gave the term “concept” a functional meaning, considering it as the framework of any possible action. Peter Belohlavek went further. 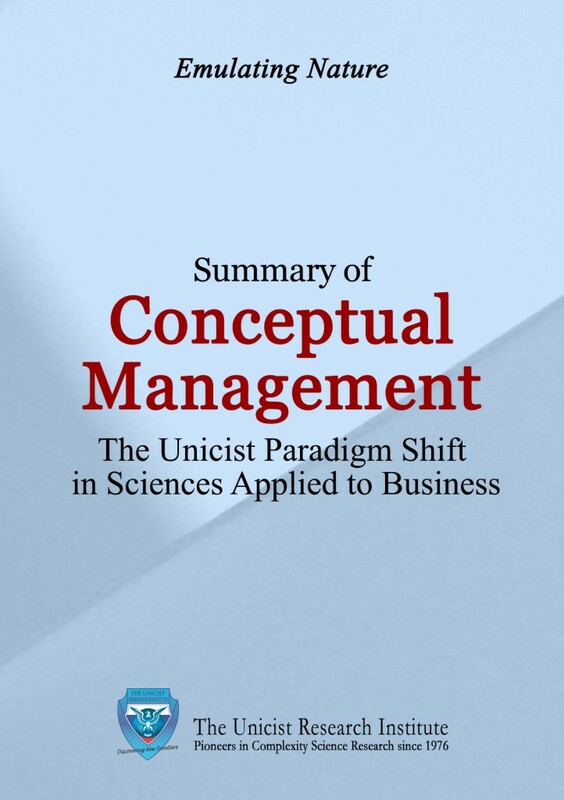 He developed a complexity science approach to deal with complex adaptive systems that integrated philosophy, science and action in a unified field: reality. He approached what he called extrinsic concepts, which are the ones deposited by humans on the elements of their external reality. 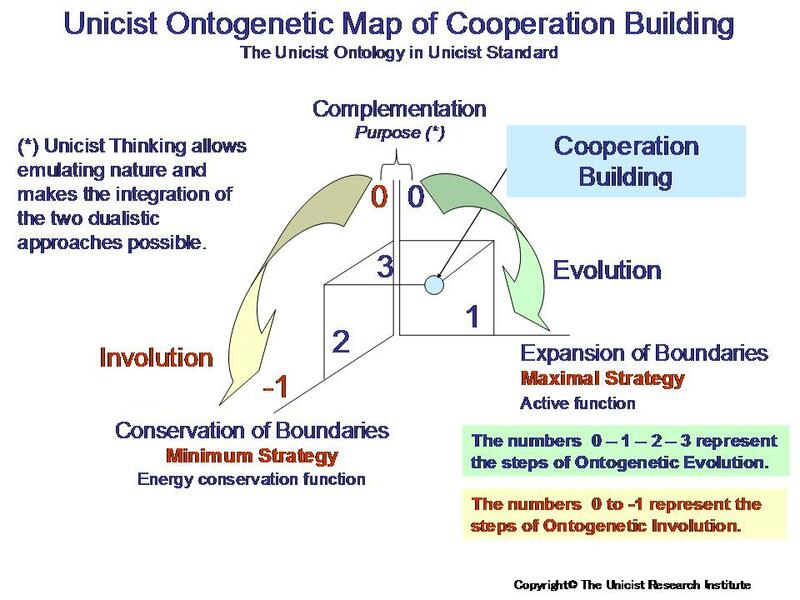 He defined that such concepts have a functional structure that emulates the ontogenetic intelligence of nature. A purpose that is homologous to the purpose in nature. An active function that is homologous to the active principle in nature. 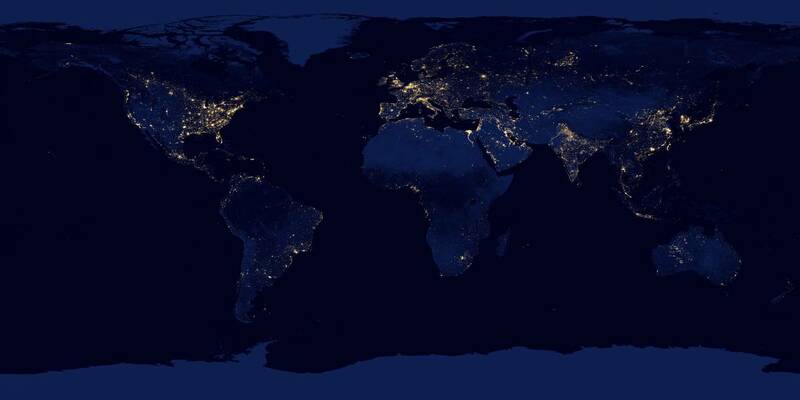 An energy conservation function that is homologous to the energy conservation principle in nature. The knowledge of the structure of concepts makes their access becomes easier and allows using them as the “stem cells” of knowledge and actions. He also discovered the complementation and supplementation laws that are implicit within each conceptual structure and the concept of anti-concepts that is homologous to the concept of anti-matter. With the unicist approach, Peter Belohlavek integrated the Western approach and the Eastern approach but focused on a different purpose, which is the adaptation to the environment. This adaptive process is achieved by generating value and profiting from its counterpart in order to foster a sustainable evolution. 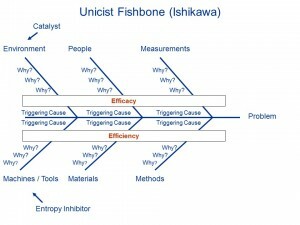 The Unicist Fishbone Method (UFM) is based on the original Fishbone developed by Kaoru Ishikawa. Conceptually, what Ishikawa developed was a method to manage the fundamentals of industrial processes. The Ishikawa method was developed to allow people, who participated in the work processes, to develop their improvements. 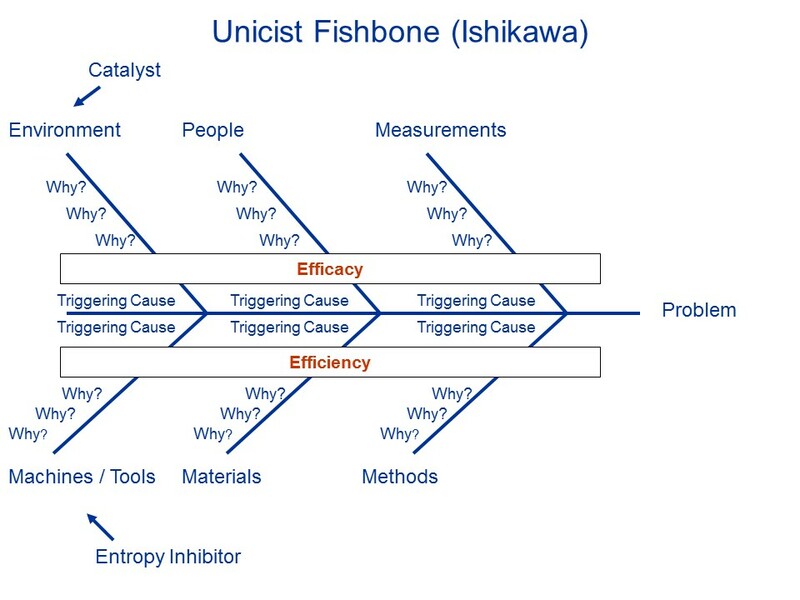 Both the original Ishikawa method and the unicist fishbone method require that people have real experience in the field that is being analyzed. 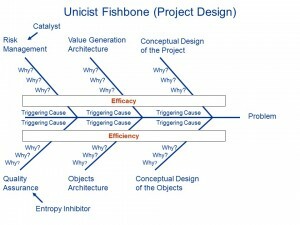 The UFM was developed using the fundamentals of the operational concept of a business function and developing a fishbone approach in order to find the root causes that drive the functionality. For example, we can consider the fundamentals of a project design process to find the root causes of the problems that allow improving such process. The fundamentals to be considered are: the value generation architecture, the conceptual design of the system, the conceptual design of the objects included in the system, the objects architecture, the quality assurance and the risk management. These fundamentals need to be dimensioned in measurable entities. This implies that, although fundamentals work as fuzzy sets, their functional level needs to be dimensioned in order to define their influence on the functionality of a process. Then they are organized as a fishbone diagram to allow the participants of a group to define the triggering and the root causes that need to be considered to improve processes. 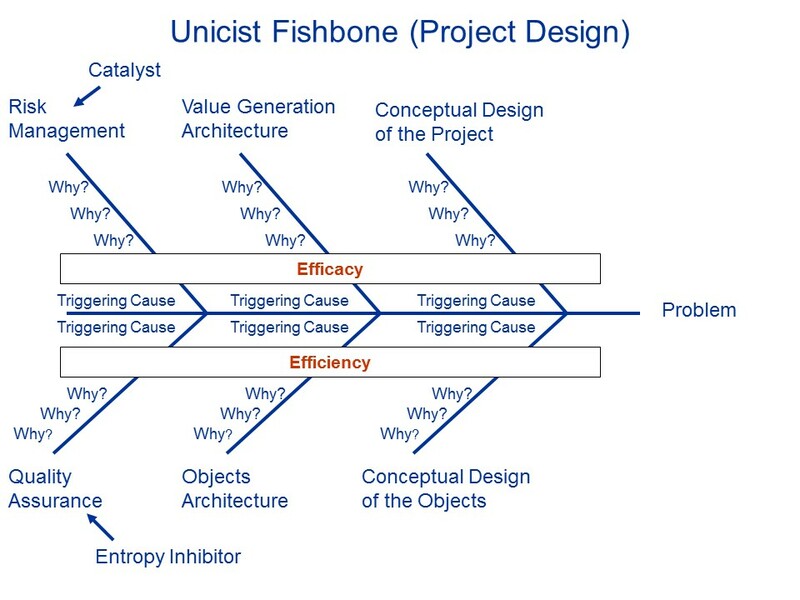 The Unicist Fishbone Method includes the methodology to be used to find the root causes of the problems that allow improving processes. 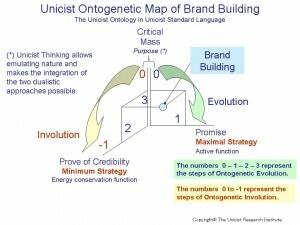 The discovery of the Unicist Ontology of Brand Building defined the nature of the functionality of the building of a Critical Mass, a Promise and a Prove of Credibility in the evolution of brands. A “Brand” was defined as the materialization of the image of a living being or an unanimated entity. The brand is installed in mind as an iconic symbol that can be a name, term, design, symbol, or any other feature that identifies the entity. Brands work when they are installed in the long term memory of an individual which produces an automated recall of attributes when the iconic symbol of the brand is perceived. Brands are paradigmatic ambiguous semiotic signs which have two integrated meanings that need to be within their attributes. Iconic symbols are the guiding signs that drive towards the perception of the attributes of a brand. On the one hand, a brand implies a promise of something that is going to happen, and on the other hand, it includes a “prove of credibility” that makes the promise believable. The brand identifies the role of an entity. That is why brands are necessarily functional and their functionality is limited to the role of the entity. The purpose of a brand is to generate a critical mass to influence people in order to install a preconceived perception in their memory. That is why brands work as catalysts or inhibitors of actions. Personal strategies begin with heroic actions to find a place in the world but achieve their maturity when conquering actions become possible to expand the boundaries of one’s activities. Strategic actions seek to influence the environment actively. The action principle is given by the maximal strategy that is based on the opportunities offered by the environment. The minimum strategy, depending solely on the influencer’s action, is its energy conservation principle. 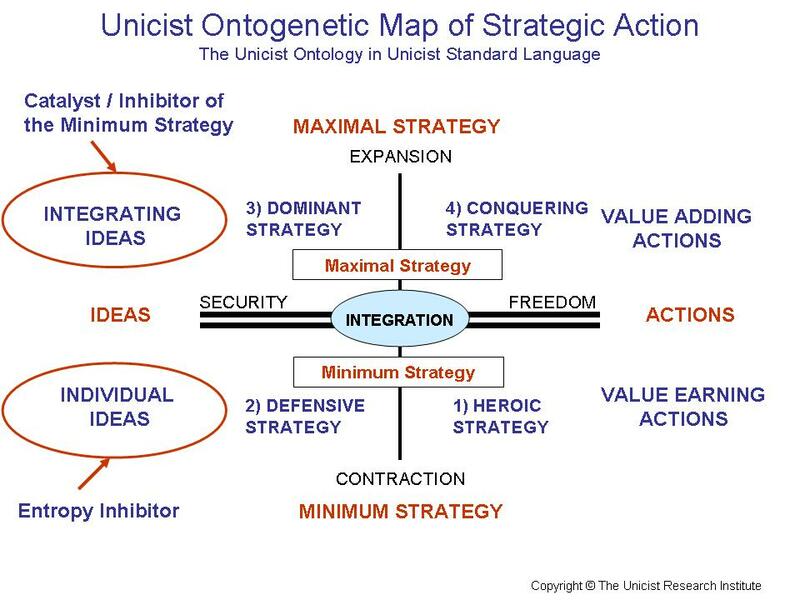 There are four ontological segments to develop strategic actions: Heroic Strategy, Defensive Strategy, Dominant Strategy and Conquering Strategy. The heroic strategy is performed by those who develop strategies based on individual heroic actions. They are basically subjectivists who consider that individual efforts and smartness can prevail over systematically planned actions. Heroic strategies are based on the personal costs individuals or members of a group are willing to pay. Such individuals confront problems as personal challenges. The Defensive Strategy is performed by those who master the situations in which competitors attack. These individuals are extremely smart when it is necessary to create alternatives to weaken others’ arguments. They are usually very good analysts and utopists. Their ideas prevail over action. They use their opponent’s forces to attack the implicit weaknesses of their strengths. The dominant strategy is performed naturally by those who are secure strategists and feel the need of taking the opportunities of the environment. They are extremely good at diagnosing, and are able to picture the unified field of a business strategy without considering their personal interest. They are strict ethical managers. They are never satisfied. They always feel hunger for new expansive actions. This strategy is developed by those whose personal driver is conquering new positions. They are natural doers with a strong intuition to perceive reality and its needs. Conquerors are smart organizers. They usually lead their conquering campaigns personally. Innovations and the creation of new paradigms are their natural tools to conquer new fields. Speed based strategies and an endless energy reservoir are their raw material to adapt to the environment. Cooperation is defined as the building of a common space of complementation in which the expansion of the boundaries of the participants becomes possible, while the individual limits of the members are respected. The driver of cooperation building is the need to generate additional value. This requires an extreme focus on the results that need to be produced, using an integrative logic to integrate the needs of the participants and the external goals to be achieved. Therefore, the generation of additional added value is part of the nature of cooperative environments. Cooperation is based on human gregarious instinct and is natural between groups of people who have decided to expand their boundaries. It is easily observable in the cooperation of countries and organizations of any kind. It adopts many shapes: collaboration, alliances, federations, confederations, etc. Cooperation is not feasible in extreme individualistic or involving environments. In these environments competitiveness becomes extreme and cooperation is seen as a weakness. This is a paradox that condemns these types of environments to live in a stagnated context with endless conflicts and/or conflict avoidance actions. 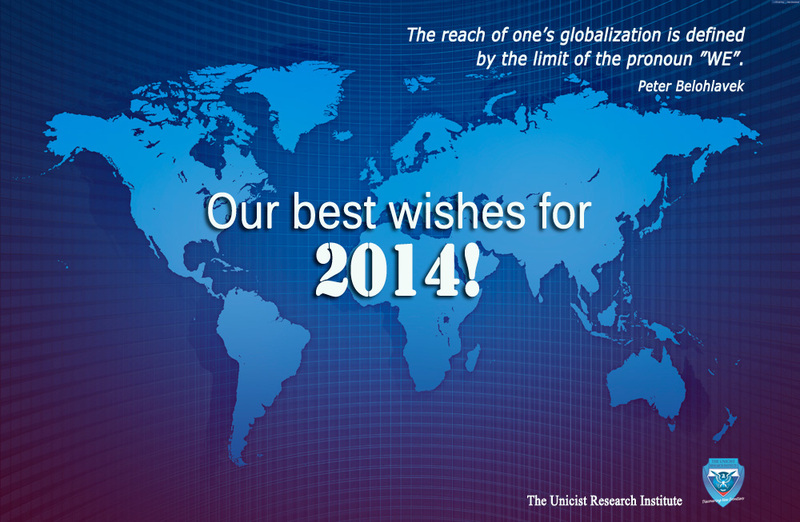 Our best wishes for 2014: Happy New Year! “Cooperation in Diversity” is much more than our motto. It is a way of living. Make your wishes come true. Confederations are the most powerful model to organize structured growth. They were born as soon as human tribes began to fight to broaden their “vital space”. Confederations appeared to ensure defense and in some cases this is still the reason for their constitution. But this was only the beginning. Soon they became a model to expand activities. The confederative model can be seen frequently in the organization of countries, professional associations, unions, sports, highly differentiated franchises, etc. 1) They need to have a superior functionality in the segment they deal with. 2) They need to have a superior ethic in that segment. 3) They need to have a strong spirit de corps. 4) They need to be internally transparent. 5) They need to have a stable “currency”. 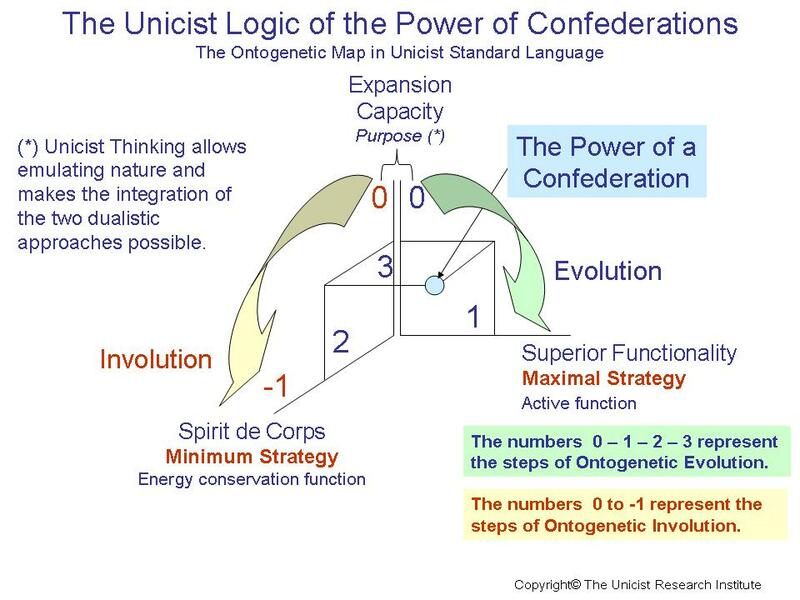 Having the necessary expansion capacity, a superior functionality and a spirit de corps defines the power of a Confederation. Formal Confederations that are not adequately structured degrade the relationships with their members and with the environment.